With the blessings of Shri Mahashakti Durga, one surely gets health, popularity, power, victory, family love and happiness. When one has difficulties, particulary huge problems which seem impossible to overcome, or when one realises that one must fight against some unseen and evil forces, one immediately remembers Shri Mahashakti Durga, the world mother. For solving all problems and gaining protection, the child always turns to the mother. The texts and musical compositions have been specially selected based on proved traditions and scientific research. 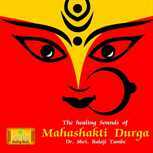 The compositions based on ragas Madhuvanti, Basant, Malkauns and Durga have been selected to suit the energy of Shri Mahashakti Durga and the related bio-energy centres. All the compositions on the album are useful for daily listening and particularly during Navarati time.